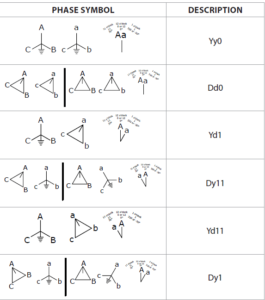 Transformer vector groups can be a difficult concept to understand. I was lucky because the transformer ratio test-set I used for the first couple of years in my career allowed me to make three-phase connections, but it was really a single-phase tester and I had to change the connections one phase at time. This forced me to have a good understanding of transformer vector groups because I had to figure it out every time I tested a transformer.Today’s equipment allows you to connect all three-phases and push a button. The test-set applies some test voltages to figure out what kind of transformer it is, and then does all the work for you. That’s great for old hands who have figured out transformer vector groups so many times that their burned into their brains forever, and new testers who need to get the job done; but it is always important to understand what you are doing first.This link is an excellent primer on transformer vector groups. I strongly suggest anyone who doesn’t have a complete understanding of vector groups give is a visit.http://electrical-engineering-portal.com/understanding-vector-group-transformer-1 Of course, The Relay Testing Handbook series also covers transformer vector groups in The Relay Testing Handbook: Principles and Practice. Please click one of the sharing or like buttons below if you found this post useful. It helps us more than you realize!